It's absolutely no secret how much my family enjoys not only the Kung Fu Panda movies, but also the television show. I believe I've mentioned it a few times before. We've watched pretty much all of the episodes of the television series, so I was thrilled to receive Good Croc, Bad Croc on DVD. I absolutely love that Jack Black is still the actor playing Po in this series. This series not only makes our entire family laugh, but it's one cartoon that we all can watch together over and over again. With the humor and great story line of the television series I hope they continue to release more episodes. I'm still awaiting news for a part three in the movie series. If you have yet to see any of the episodes of Kung Fu Panda or have yet to watch the movie, I highly recommend it. 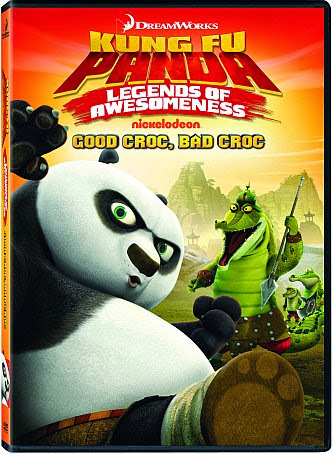 This is even a show I think adults who don't have kids would enjoy to watch and now you can since Good Croc, Bad Croc has been out in stores since June 18th! Disclosure: All opinions are my own. I received Kung Fu Panda DVD at no cost for the purpose of this review. No other compensation was received.